At present the project in Nottinghamshire, which is supported by the Government’s Broadband Delivery UK programme and Openreach (BT), has already made “superfast” speeds (mostly via FTTC) available to around 98% of local premises (some 80,000+ extra homes and businesses). Further work is also expected to continue under Phase 3 of the project, albeit focused more on extending ultrafast Fibre-to-the-Premises (FTTP) technology to another 3,000 premises in rural parts of Bassetlaw, as well as the Newark and Sherwood districts (starting this spring). There’s also scope for additional work to take place until the end of 2020 as more public reinvestment is made via future gainshare (clawback). “The fact that Nottinghamshire has one of the most comprehensive superfast broadband networks in the country is a major selling point for the county when we are competing with other areas to attract new jobs and investment. According to independent estimates, the Better Broadband for Nottinghamshire programme (BBfN) will be worth £302m to the local economy over a 15-year period, representing a return £11 for every £1 of public and private investment made. 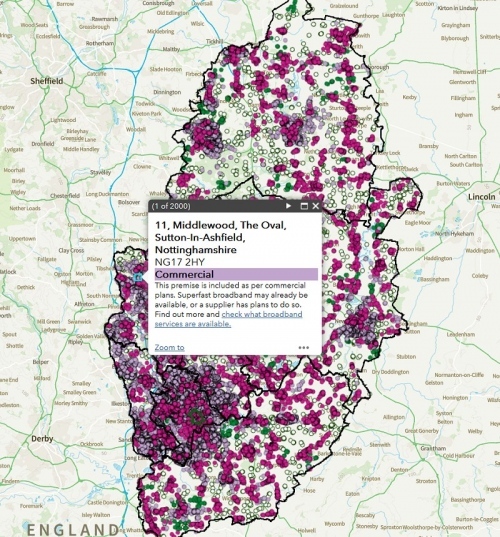 The council claims that this is “the most detailed mapping tool of its kind” but we have seen other BDUK based projects with interactive maps of similar or even better detail before. One other issue is the fact that they’re only launching this map toward the latter stages of their roll-out but it would have been much more useful to have several years ago. Residents will also have the option to register their details on the website to receive regular updates and reminders to take-up superfast services, where they are available. This is tricky to do given Ofcom have yet to fully define a ‘reasonable request’ for full fibre off subsidised infrastructure. Work outstanding since 2017 WBA review. I think the ‘reasonable request’ needs to treat its point of origination as the spare fibres serving each cabinet, even if BT want to run separate cables from an aggregation node. Public funding cannot be used to roll-out superfast broadband if such a network already exists in the area. This is a general state aid rule as public investment is only supposed to be used in areas where people have no NGA option at all (i.e. market failure). Admittedly the rules aren’t perfect and sometimes there’s a delay between Open Market Reviews, which can result in little bit of overbuild between networks. But this is uncommon. If you have Virgin then you do have a superfast broadband connection surely? You would actually have an Ultrafast connection though surprised BT don’t go to an area Virgin are in.